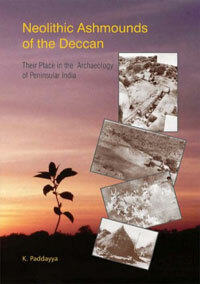 Neolithic ashmounds of the Deccan represent burnt cow-dung accumulations and occupy a unique place in the archaeological record of the world. Their initial discoveries stretch back to the opening years of the 19th century. Setting aside various fanciful opinions expressed about their age and origin, Raymond Allchin of Cambridge University published a full monograph titled Neolithic Cattle-Keepers of South India: A Study of the Deccan Ashmounds (1963). Combining archaeological evidence from his explorations and excavation at Utnur with ethnographic data of various kinds from the area, he showed that the ashmounds were seasonal cattle camps of the Neolithic pastoralists. Further, he convincingly argued that the accumulated cow-dung deposits at these camps were intentionally burnt as part of cattle fertility rites.The present monograph is the second major publication on the topic of ashmounds. It is based on Paddayya’s fresh field studies of all major ashmounds in southern Deccan and seven seasons of large-scale excavations at Budihal in North Karnataka. While confirming Allchin’s views about the Neolithic age of ashmounds and association of cow-dung burnings with cattle fertility rites, Paddayya goes one step further and asserts that these sites represent year-round pastoral settlements with a provision for cattle penning, cow-dung disposal and human settlement. In addition, Budihal preserved evidence of human and animal bone burials, an animal butchering floor connected with community feasting and an extensive workshop of chert blade industry which supplied finished products to other sites in the region. Budihal was a regional centre where the Neolithic groups from nearby sites gathered on periodic occasions similar to present-day jatras and cattle-fairs and entered into socio-economic transactions of various kinds leading to maintenance of regional cultural identity. Paddayya also insists that many adaptive as well as mind-expressive aspects of the folk cultures of the Deccan have their roots in the Southern Neolithic culture. He concludes by emphasizing that topics like the one dealing with ashmounds serve to underscore the need for bringing the archaeology of Peninsular India centre stage in future archaeological investigations in the country. K. Paddayya is Emeritus Professor and former Director of Deccan College (Deemed University) in Pune. He is Honorary Fellow of the Society of Antiquaries of London and received Padma Shri from the Government of India in 2012.